Home / Life Rambles / Mom Problems / Parent Advice / Parenthood / Ramblings / Stroller / Toddler Life / My Child Still Uses A Stroller, How Is That Your Problem?! My Child Still Uses A Stroller, How Is That Your Problem?! I've never been one to feel bothered when I've gotten the weird look from people who think that my child should not be using a stroller anymore. That was until a few weeks ago. As we walked out the building and Valentina sat in her stroller, Humberto got ready to carry the stroller down the outside stairs that were left. There was a little girl, about 2 years old walking towards us and pointing at Valentina while smiling, really the only reason I noticed was for that reason. As she got closer I could hear her saying girl, the moment Humberto put the stroller down on the pavement the little girls finger was at the bottom of Valentina's feet and she was smiling. A smile started to spread on my face and as I opened my mouth to say Hi, her dad came up from behind and smirked. He pulled the little girl away and said "Oh yeah, you see that girl is still in one of those. Humph, you don't need that anymore, it's for babies" and started laughing as he walked away fast. Just like that it felt like I'd been slapped in the face. My smile disappeared so fast and before I got a chance to say something, he was gone. Trust me when I say that I wanted to say something. Why I felt this way I'm not sure?! I've gotten a few of the awkward, oh your child is still in a stroller look but never felt this way before. Valentina is 3 years old and a little tall for her age, depending on the stroller that we are using she looks a little bit big in the stroller. But trust me when I say that she is a very active child, there are times when I'll take the stroller and Valentina will not sit in it at all. But she is after all still a child and when I know that it will be a long day of errands, a stroller is always must. Not only is it useful for carrying shopping bags but most importantly when she is in need of a nap. Why does this feel like I'm explaining myself? Do I owe someone an explanation? Of course I don't, but I'm just putting it out there. The why, the stroller is such a useful thing for us parents and why it can be one of the hardest things to let go of as our children grow up. At least for me, when I'm out and about by myself with my daughter. There's been times when I've seen older kids in a stroller and I just keep on walking. I mean is it really my business or time to judge? I'm not the one pushing the stroller, or carrying it down the flight of stairs. So why should it bother me who is sitting in the stroller?! The reason I think that it got to me that day, was because of the dad's attitude. He didn't know us or my child, so who was he to judge and what was he teaching his daughter. What he didn't know either, was that Valentina had a sprained ankle and unable to walk. A stroller was definitely a must. If you decide to have your child not using a stroller bravo for you, but don't judge those who do decide to have their children in strollers, no matter the age. It's already hard enough being a parent without having other parents bashing you for something that really shouldn't matter anyone else. Instead smile, we are all on this same journey called Parenthood. 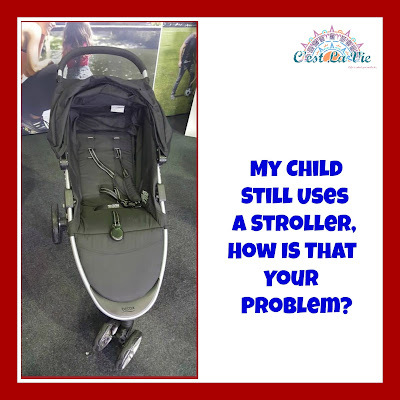 1 comment on "My Child Still Uses A Stroller, How Is That Your Problem?!" One of my daughter's used hers until she was about 6 years old. She has autism and was a toe-walker and had to get a lot of physical and occupational therapy to be able to walk long distances without fatigue. She could do a museum, zoo, or amusement park without having severe leg pain and fatigue. She also had a tendency to wander off and the stroller kept her safe when around crowds. Occasionally, I'd hear the same thing from adults - funny how children never judge, it's always the grown ups - but I didn't even bother explaining. You know why? It doesn't matter. It doesn't matter if there is a medical reason an older child is in a stroller, if it's for mom's convenience, for safety, or just because the kid likes it. People need to mind their own business.